We tend to take the flawless arrangements that have kept the tour together for granted, but was it asking too much to try to ferry the party to the other end of the island in two instalments? Going second had the added bonus of an extra two hours in bed, but there was a worrying moment when Joe was heard to say ‘we’re not lost, we just don’t know where the ground is.’ Meanwhile the others had been visiting the famous asphalt lake and arrived five minutes before the scheduled start – no-one told them they had to tar the driveways of a couple of Joe’s relatives in San Fernando as well. 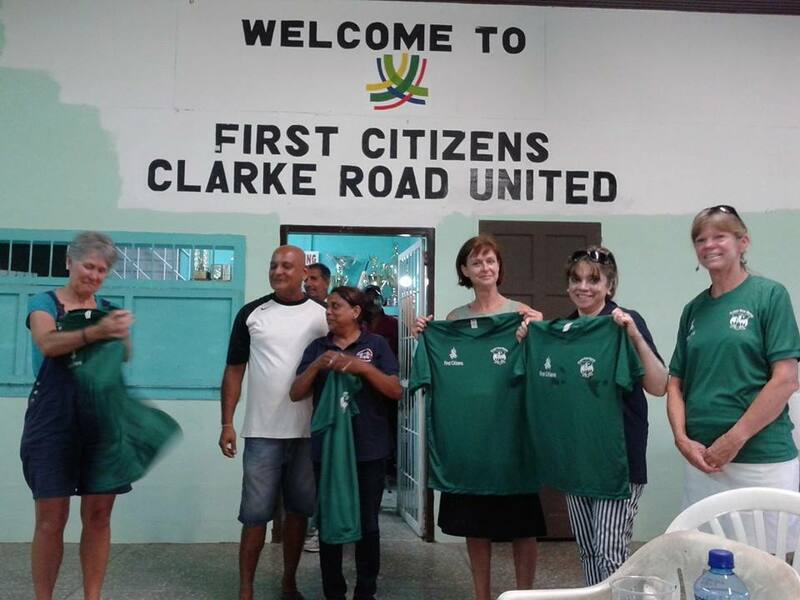 Saints, naturally enough, ended up fielding first, either by design or by negotiation with opponents Clarke Road Veterans (CRV), and with Damian, Pete and Daniel (DT Jnr.) now back in the UK and with John Quinn nursing a broken finger, bowlers were hard to find, while we also had replacement wicket keepers. 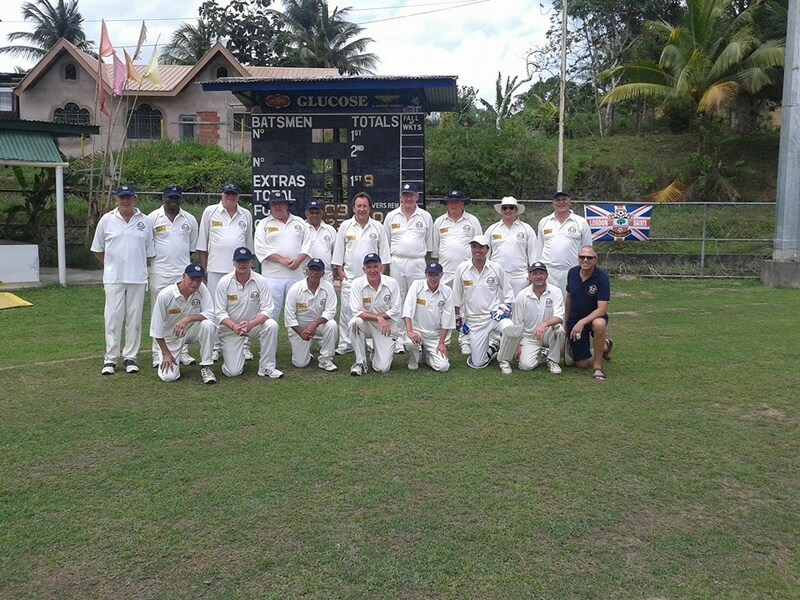 Nat (under the fighting name Manerro) made his tour debut and Dickie (shirt name Dickie, naturally enough, number 187) his club debut while all remaining gentlemen with a fully functioning set of fingers ‘enjoyed’ some time on the pitch, Nick doing a 60 over stint as umpire. It was a familiar start: runs galore, arial shots not quite going to hand, while those that did promptly went down. Andy M. missed a stumping but I probably shouldn’t name the droppers… oh, OK then: Mark, Joe and, er, Joe again. As luck would have it, I missed seeing the one that was caught, by Neil off Dave N. In fact for a long time it looked as though that would be the only wicket, CRV making 79-1 by the 10 over drinks break. That rate continued for an eventual 245-6 from 30 overs including an all run 5 wides (i.e. 6 extras in all from one illegal ball). Even that scoreline is worse than it sounds as three of the six ‘retired out’ so Dave Nanton’s 6-0-38-3 analysis is positively penetrating. Saints were not so much wilting as melting by the end and we did well to get away with just the loss of Where’s John’s hamstring and with Reggie’s body taking its inevitable battering during a bravura performance as stand-in WK. A challenging total, but Kumar and Joe gave us a solid 27 run start. Promoted to the giddy heights of number 3, I found this bowling too straight to hit and departed for a multi-over single, same score as Mark. 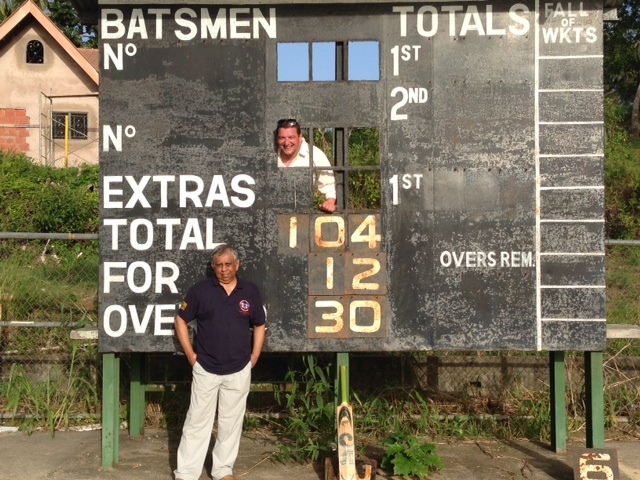 Again I missed seeing Neil’s name going into the scorebook, run out, but we then had a real partnership – 41 runs and possibly the batting highlight of the tour. 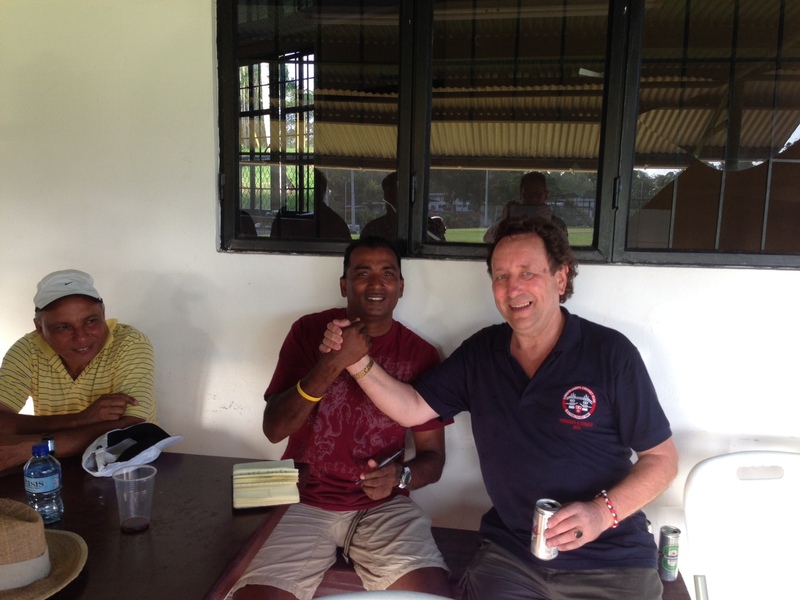 Certainly the highest individual total with Nat Ciccone contributing 30, retired by captain, with Wath getting 10 (retired, tired – photo of highest scorers Kumar and Nat above). I’m afraid Steve (1) and Andy (0) didn’t help much but Garry (1) and DT (5 not out) saw us past the all-important 100 mark, including a fit boy three – after all, these two had been more or less fielding for the rest of us put together towards the end of the CRV innings. Dave N., who has done so much to make the trip a success, bagged his second duck of the tour and to nobody’s great surprise, Reggie’s duck came off his only ball. 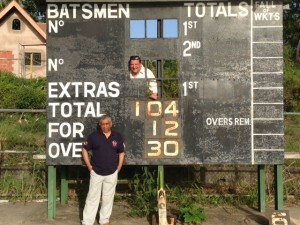 104 all out (12 wickets), although our coach driver said he would have fancied a bat. We didn’t confer about this, but it was clearly a choice between Dave’s bowling (not batting, obviously) and Nat’s innings. So I asked the impartial and authoritative figure of Umpire Head to decide, and he backed Nat on the grounds that he could have had more. That probably refers to the enforced retirement, but it could be on the grounds that he was partnered by Wath who seems to have lost his legendary speed between the wickets. Again a unilateral decision, but surely it has to be Reggie’s latest blink-and-you’ll-miss-it innings? This also amused our hosts after they were told that ‘The Master’s’ last innings had ended the same way, several years ago but at the home of cricket. In Reg’s defence, though, he was bowled by someone with seven first class wickets to his name (Dave Sultan – look him up on Cricinfo. Photo above). Marinated mangoes, cold hot dogs, hot Trini doubles (a local fast food delicacy), a splendid curry, beer and rum. Who can complain at that? After the usual speeches and inevitable award of a shirt to the skipper, CRV went the extra mile with a shirt for Dave, a cap for Nat, a mug for Garry as best fielder and polo shirts for all the ladies. They then introduced us to something called Puncheon rum, and the very special way of drinking it – shame on beer-only Reg for not taking part in that it. Steve Keenan is on diary duty for today.